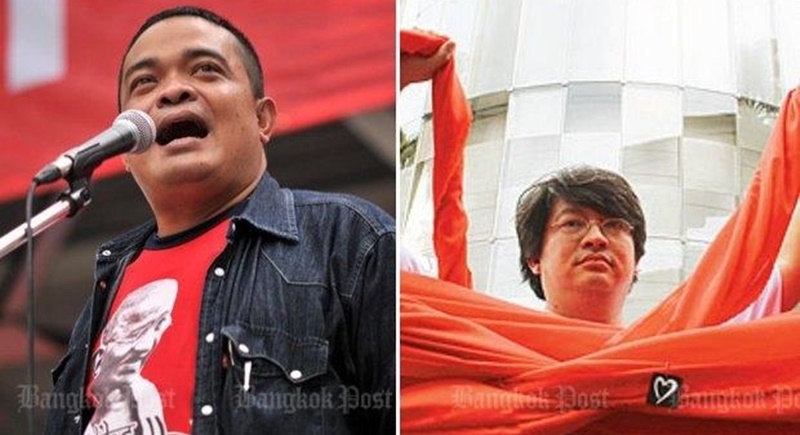 BANGKOK: Police investigators are gathering evidence to seek warrants for the arrest of red-shirt leader Jatuporn Prompan and coup critic Sombat Boon-ngamanong in connection with politically provocative online posts, deputy national police chief Srivara Ransibrahmanakul said yesterday (Apr 28). The possible charges against Mr Jatuporn and Mr Sombat are being considered following the arrests of eight Facebook users for their online messages criticising the prime minister and the regime, Gen Srivara said. Based on the investigation findings, one of the suspects, Natthika Worathaiyawich, was hired to operate websites for Mr Jatuporn and Mr Sombat, said Maj Gen Chayapol Chatchaidej, commander of the Counter Crime Planning division of the Office of Police Strategy, who conducted the probe. Maj Gen Chayapol said Ms Natthika was the administrator of several sites that were highly critical of the government and military regime, including “We Love Prayuth”, “UDD Thailand”, “Red Intelligence” and “Red Democracy”. She has received B110,000 per month from another suspect, Harit Mahaton, since March 2014 and split the money with five other suspects, who are team members. Ms Natthika also worked for the “Jatuporn Prompan” and “Peace TV” sites and was paid B20,000 per month. She was also allegedly paid B992,500 by Mr Sombat to operate sites criticising the People’s Democratic Reform Committee from December 2013-March 2014, Maj Gen Chayapol said. The sites have since been shut down. He said Mr Harit was identified as a content adviser for “We Love Prayuth” and “UDD Thailand” and paid B28,000 for his services. His contact was allegedly Chaitat Rattanajan, a ninth suspect who is currently overseas and was believed to have received instructions from another unidentified person. The rest of the eight suspects in custody are Noppakao Kongsuwan, Worawit Saksamutnan, Yothin Mangkhangsanga, Thanawat Buranasiri, Supachai Saibut, and Kannasit Tangboonthina. The eight suspects have been charged with inciting public unrest under the Criminal Code’s Section 116 and breaching the Computer Crime Act for Facebook posts that can be used to instigate chaos. The charges were levelled against them shortly after their detention by the military. They were escorted by National Council for Peace and Order (NCPO) officers to report to police at the Crime Suppression Division (CSD). A small commotion erupted when a team of lawyers from the Thai Lawyers for Human Rights Centre tried to get through a police barricade at the CSD and attend the questioning. They were told to wait until the police procedures were completed. Khoomklao Songsomboon, a representative for the lawyers, slammed the military’s handling of the suspects yesterday and the police decision to pick lawyers for the suspects without their consent. She insisted the suspects have the right to choose their own lawyers. The group also sent a team to lodge a petition with the Criminal Court seeking the release of the eight suspects. The court is scheduled to issue a decision today (Apr 29) at 10am. Early in the day, NCPO spokesman Col Winthai Suwaree said the suspects operated as a team as he brushed aside calls by Amnesty International for the suspects’ release on grounds that the rights group had insufficient information. Ten people were rounded up by the military on Wednesday (Apr 27), but two were released shortly after being cleared of any involvement. According to Col Winthai, the charges against the eight suspects are based on evidence and their statements. The NCPO spokesman also dismissed criticism that the suspects were being treated unfairly as untrue. Mr Jatuporn yesterday led a group of United Front for Democracy against Dictatorship members including Natthawut Saikuar and Tida Tawornseth to the 11th Military Circle in Bangkok’s Dusit district to meet the eight detainees. However, their request was rejected by authorities who said the detainees would be brought before a military court. Mr Jatuporn denounced the regime’s actions, saying it should stop the practice of taking people from their homes without being informed of the charges against them and handed over to police. He said the detention of the eight individuals should be the last as it would create a climate of fear in the run-up to the Aug 7 referendum. The red-shirt leader reiterated his call for international bodies to observe the referendum and warned authorities not to intimidate the people as it could result in resistance strengthening. The Pheu Thai Party issued a statement yesterday calling for an amendment to the Referendum Act to ensure that freedom of expression is guaranteed as the charter referendum approaches.